Just in time for Halloween, The Wall Street Journal has discovered a new bogeyman, and it lives right in your wallet. Think about it for a minute. Who knows more about you than anyone else in the world? It’s Visa or Mastercard. If you are like me, you are using plastic for nearly everything that you buy or do. So that means that these companies know where you go, what you buy, how much you spend, and how you spend your time. From that, they can deduce an enormous amount of information about you, including your routine commuting schedule, your interests, and your tastes. As you probably know, all the basic information about you (age, gender, location, income) have become commodities on the web – readily available to any company that wants to choose which ads to display to you – or anyone else who is just curious. But the quantity and level of detail which the credit card companies have about us represents a radically deeper threat to our privacy. MasterCard boasts that they will be a “much more precise targeting mechanism.” MasterCard is, of course, aware of the potential backlash against using information which most of assume is confidential. So, they claim they do not retain individual names with the marketing data they collect. Translation? It means they first strip off an individual identity, store the detailed transactions, and then work backwards to figure out who you are and what you are like. It is a very sophisticated process involving “inferred links” to “triangulate different attributes” but yields “very high quality” results. As if that were not enough, let us turn our attention to US Patent Application number 2011/0087550, which was issued on April 14 of this year to Visa USA, Inc. According to the patent application, Visa sees an opportunity to go far beyond shopping details, by pulling in information from social networking websites, credit bureaus, search engines, insurance claims, and – get this – DNA databases. So Visa is openly laying out a plan to combine credit card information with any and all other information available about us on the web, whether now (credit bureaus) or in the future (DNA databases). That’s really scary, isn’t it? 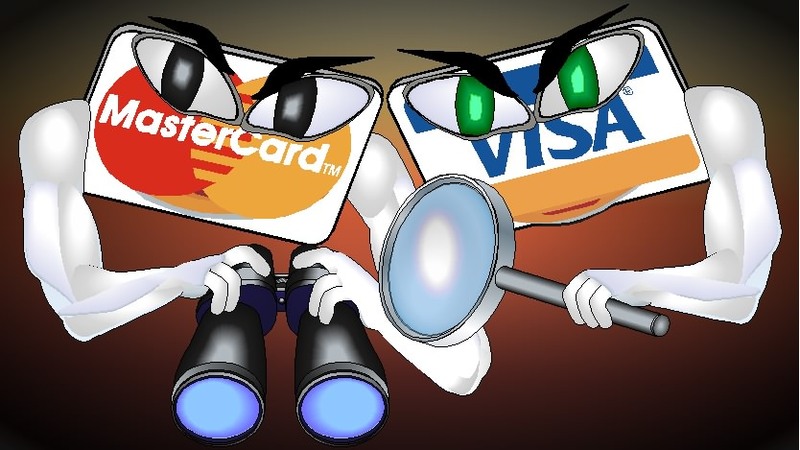 This Halloween, I suggest you dress up your kids as Visa and MasterCard, then explain to your neighbors about the tricks that the credit card companies are planning.